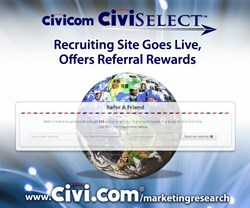 Civicom Marketing Research Services has launched a CiviSelect™ Recruiting website as a portal for sourcing research project participants. In addition to applying to join the panel, potential respondents can also refer others and be paid for it. CiviSelect™ features an online ‘Apply for Our Panel’ link wherein interested individuals can apply to become research study participants. CiviSelect™ Recruiting helps the proponents of research projects find the right participants for their studies. Clients who contract with Civicom® CiviSelect™ can also avail themselves of the full range of recruitment management services that are made available to them through CiviSelect™. Because of Civicom’s global capabilities in providing services to market researchers, users of the CiviSelect™ panel can also use CiviSelect™ as a resource for multi country projects. Clients can book research projects through the client portal on the CiviSelect Recruiting site. CiviSelect™ features an online ‘Apply for Our Panel’ link wherein interested individuals can submit a form to apply to become research study participants. The online panel application is the first step in the screening process for those who want to become part of future market research projects. All applicants are veted for accuracy of the personal data they report before they will be released into a research study. Signing up via the online panel link is free of charge. The CiviSelect™ recruiting site also features a referral program, which rewards individuals for their efforts in pointing the recruitment team in the right direction in their bid to find their next study volunteers. Rewards are processed after a referral participates in a research study. When it comes to the implementation of best practices, organizations all over the world have counted on research projects. With the use of these targeted studies, the behavior and preferences of particular groups of people can be determined. Such research involves data collection and processing, in order to produce a conclusive report. This output information can then be used as a guide for identifying ideas and formulating business strategies for the client organization. Qualified respondents are necessary as a foundation for making the output of these studies useful. Sourcing respondents through CiviSelect™ can be compared to hiring a highly-sought after head hunter when an important company position needs to be filled with someone who possesses the right skill set. Civicom® Marketing Research Services is a global innovator in qualitative research tools using the latest technology solutions for marketing research. The company works hand in hand with market research firms, through Civicom® CyberFacility®, facilitating telephone and web-based IDIs and Focus Groups that enable projects to have extensive, global reach. Civicom® also offers Civicom InSitu® mobile qualitative research and Civicom Chatterbox® online multimedia bulletin boards. Civicom operates globally in 96 countries and offers extensive translation services for marketing researchers, as well as transcriptions through TranscriptionWing™. To learn more, email Civicom® at inquire(at)civi(dot)com or call +1-203-413-2403.